bamboo zone. Animal trails through the moorland, with some rocky sections close to the summit. Stunning rock formations along the route. 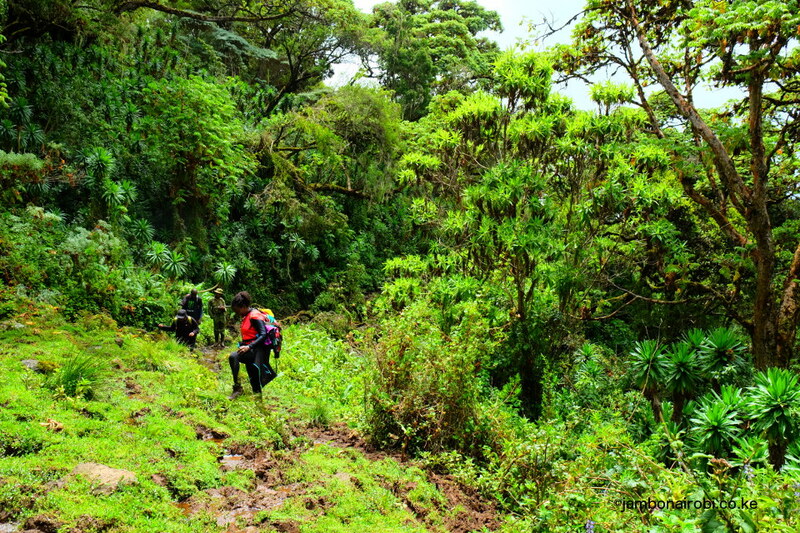 With hardly any other hikers venturing on this trail up the Aberdares from Mutarakwa Forest Gate to Kinangop Summit, and limited network coverage, here you can truly unplug and immerse yourself in nature. It is a gentler climb that the alternative route over Elephant Hill, making it easier for the average hiking enthusiast to reach the summit. 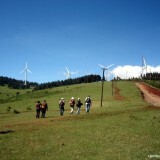 Mutarakwa Forest Station is at 2600m asl, northwest of the Kinangop Summit. 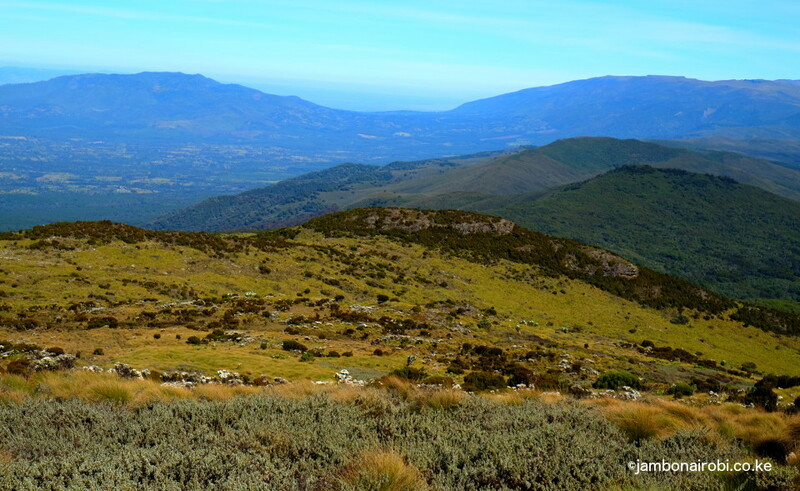 The hike takes two-days, with an elevation gain of about 1600m. 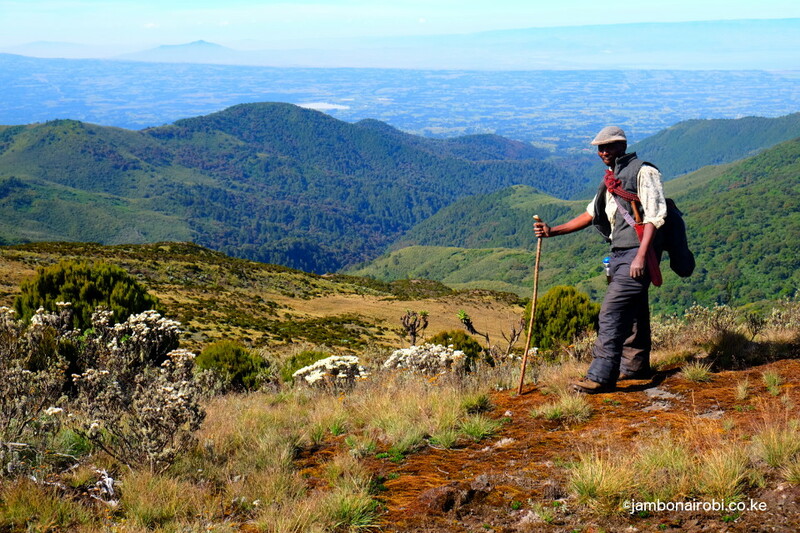 Once you go past the forest section onto the southern Aberdares moorlands, you’ll have unimpeded views of most of the significant Aberdares summits, the lowlands on both sides of the Aberdares range, Mt Kenya, and a number of the volcanoes on the Great Rift Valley. The first 4km of the hike from Mutarakwa Forest Station goes over a dirt road traversing a plantation forest. Local farmers practice the Shamba system of growing potatoes, cabbages, and carrots on newly cut forest lots while taking care of young tree seedlings until they are 3 years old, before moving to another forest lot. 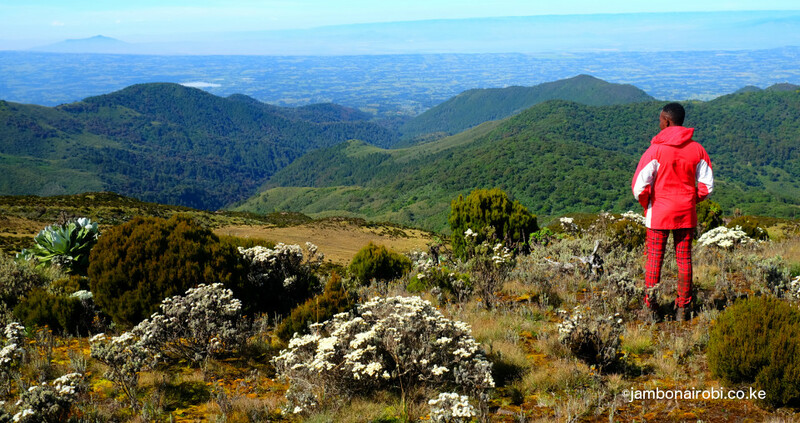 At the Park boundary, you’ll cross an electric fence surrounding the whole of the Aberdares National Park, and enter an indigenous forest with gigantic Red Cedar, Podocarpus and other native trees. In places, the animal trails are blocked with undergrowth, so you’ll generally depend on your Guide to clear the way, and navigate in the right general direction. The undergrowth gets thicker in the Bamboo zone, with the Guide’s machete coming into more frequent use. At this point, you’ll probably have totally lost orientation, and put your complete trust in the Guide. 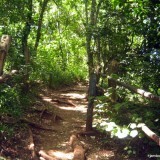 At some places, the trail breaks through the heavy forest canopy into open clearings. In those moments, the warm sunlight kissing your skin feels wonderful, although you cannot help noticing from the numerous muddy elephant and buffalo footprints that these are their regular hangouts. Realizing that hanging around is probably not such a great idea, you reluctantly move on back into the deep forest canopy, and another interlude of bundu-bashing. As you approach the end of the Bamboo zone, the forest thins out, with Hagenia Abyssinica (African Redwood) trees becoming the predominant species. These soon peter out, to be supplanted by Giant heather bushes as the forest opens out into the moorland. 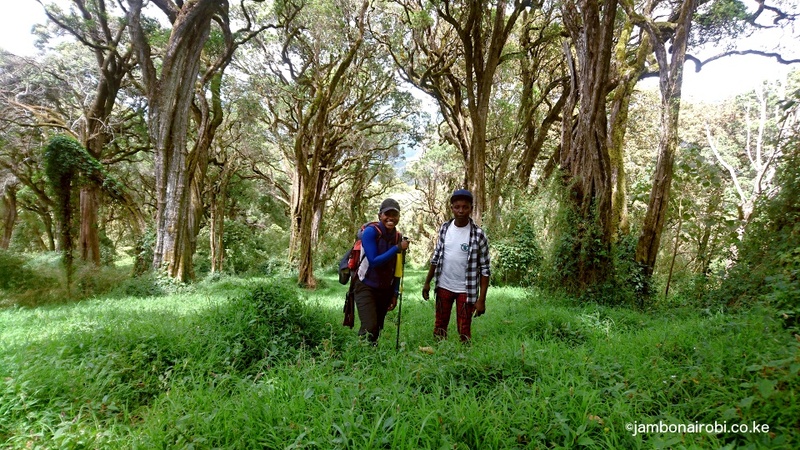 From here on, animal trails in the southeastern direction of Kinangop summit are fairly easy to follow. Giant Senecio stands and some Lobelia plants decorate the tussock grass covered landscape, enhancing the attractiveness of the panoramas all around. If you turn around and face back the way you came, the two breast-shaped mounds in view are Mt Kipipiri to the left, and the Aberdares highlands to the right, with the infamous Wanjohi Valley in between. 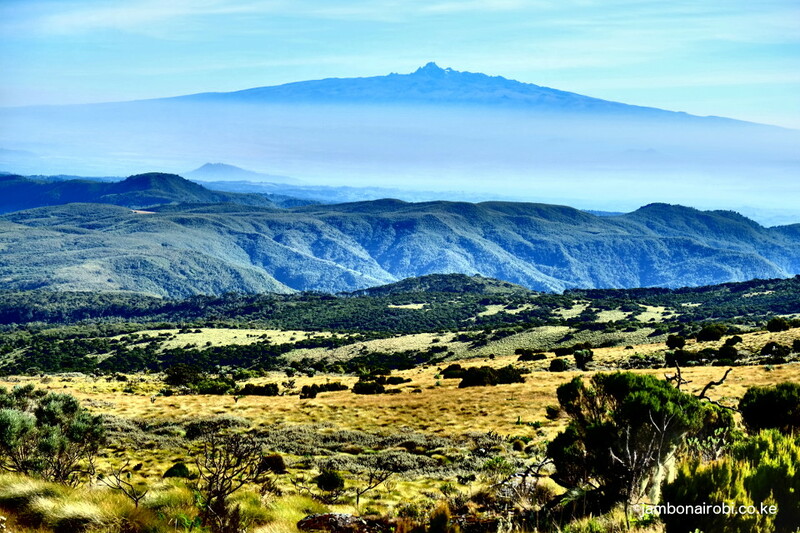 The Table Mountain and Rurimeria are located on the Aberdares highland seen in this view. 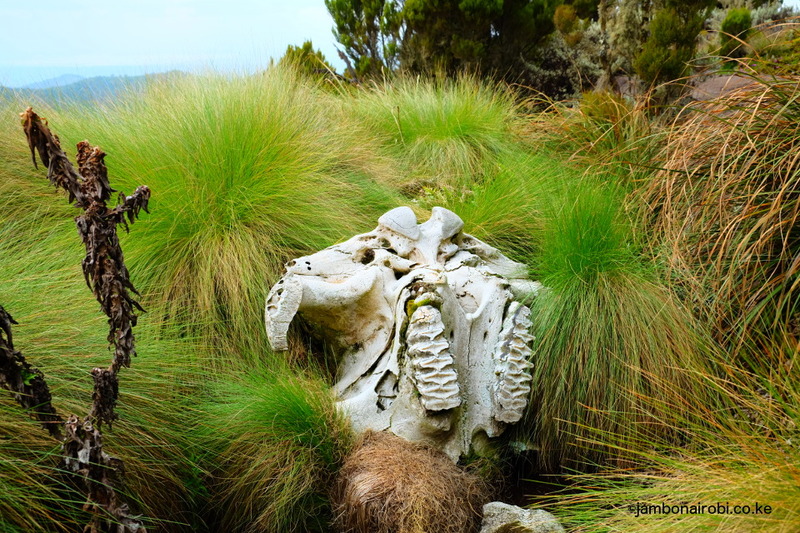 An impressive old elephant skull marks the trail halfway to the next prominent landmark, a plane crash site. 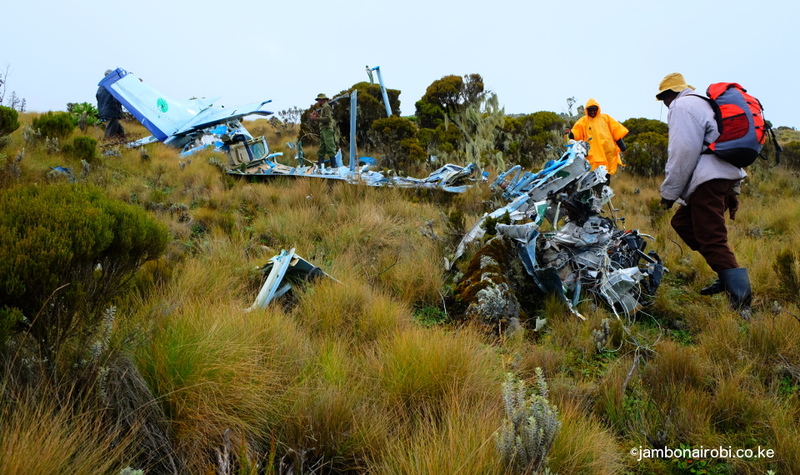 When the debris from the plane crash comes into view, that’s your cue to veer off the trail to the left and find a suitable camping spot next to a river down below. You’ll drop about 200-300m below the elevation of 3600m reached so far, and get into a forest of Giant Heather bushes, to reach the closest mountain stream. This day’s hike should take you about 7 hours, assuming you are carrying backpacks with your camping gear and food for the night. From the makeshift campsite next to the river, head back up to the previous day’s trail, turn left, and continue in a southeast direction to Kinangop summit. In the early morning hours, Mt Kenya will generally be clearly visible to the east, so take the time to enjoy that view. To the south, Sasumua Dam, Mt Longonot, and Mt Suswa will also be visible. 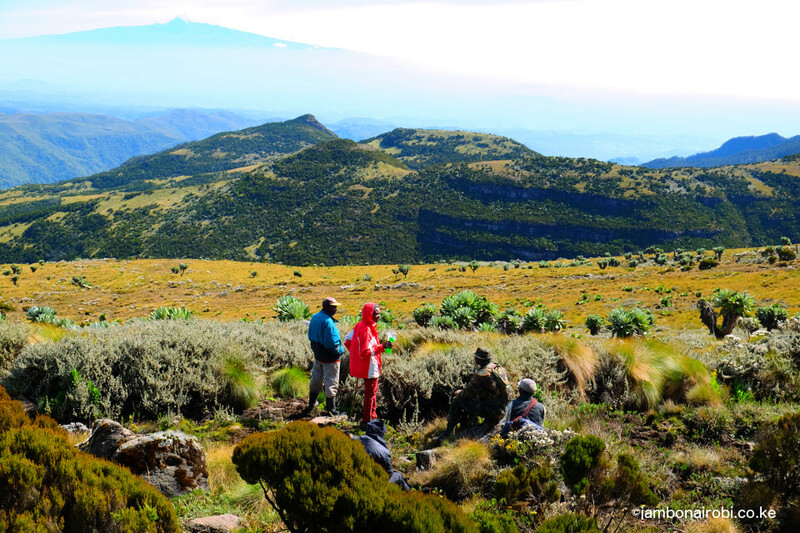 Two hours into the hike, the Kinangop summit also comes into view dead ahead. 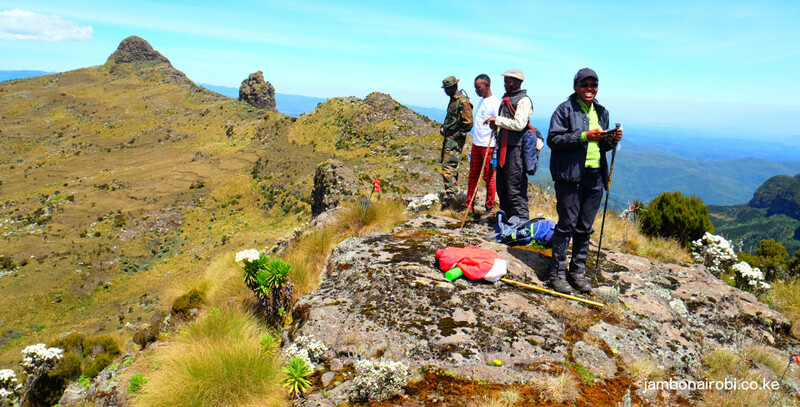 Another hour of hiking finally brings you to the base of the Kinangop summit. You’ll notice that there are two summits about 500m apart, each about 50m high, with a jagged rock between them. The first summit you will reach is the higher of the two, at 3906m asl. On its right-hand side end, there is a rocky face that provides the best approach for scaling it. It is rather steep, requiring some rock climbing skill and a bold spirit. 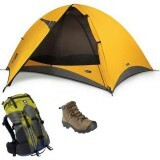 For the adventurous, it’s a treat; the perfect climax to the hike. At this point there is plenty of time to scale the second summit, standing at 3864m asl, and descend to Mutarakwa Forest Gate before nightfall. This day’s hiking should take you about 9 hours. If using public means, take Ndunyu Njeru Matatus from the Old Nation House roundabout and alight at Engineer. 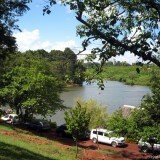 Here, you can get local taxis or boda boda to Mutarakwa Forest Station, about 7km away. If driving from Nairobi, use Nakuru Road on the upper escarpment for about 60km to a place known locally as flyover. 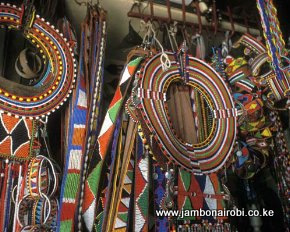 Go over the flyover, then a few meters on, turn left at the next junction and drive about 24km to Njabini town. Turn left onto Ol Kalou Road and drive to Engineer, then turn right. About 1km ahead, turn right onto a dirt road and drive about 6km to Mutarakwa Forest Station. 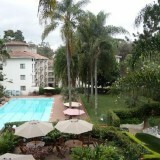 The total distance from Nairobi to Mutarakwa Forest Station is about 110km. 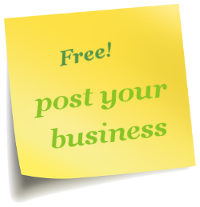 Kinuthia – Tel 0705 876261. He only speaks Kikuyu and Swahili, so if you need help communicating with him, ask for assistance from the local KWS personnel, since they’ll also be part of your hiking party. Call either Corporal Rago (0791 956226) or Anthony (0707 572673), both based at the KWS office at Ndunyu Njeru to make arrangements for an armed ranger, and settle park entry fees. Only M-Pesa mobile payments are accepted.